The rally will also mark the launch of a new science lobby group, supported by scientists from, among others, Oxford, Cambridge, Imperial, UCL, Manchester, Birmingham, and Nottingham. One scientist confirmed as a banner-waver on May 15 is Sir John Cadogan, former president of the Royal Society of Chemistry and the first director general of the Research Councils. The lobby day has a three-part methodology, if you will. A rally will kick everything off in the morning, then campaigners will stage a photo stunt (details tbc; white coats and goggles?) and then they will meet with their MPs to urge them to write to science minister David Willetts. More than 90 scientists have signed up to send letters to MPs, asking to meet with them on May 15. The first letters were dispatched last week. Confirmed plans, including numbers of MPs willing to hear from the scientists, will likely trickle out over the coming weeks. Although the nascent group has little formal structure yet, it is headed for now by Professor Anthony Barrett from Imperial’s chemistry department. Barrett’s involvement signifies just how central to the group will be this fight it picks with the EPSRC. As PST reported last November, chemists are not happy being fortune tellers. Many scientists would undoubtedly welcome a new lobby group – perhaps to continue the broader based work of Science is Vital, which grew up at the time of the spending review but is now less active. The success of the group, however, may hinge on its success in this crucial battle at the EPSRC. Parties interested in being involved in the new group or on May 15 should contact Barrett’s PA, Rachael Youren on r.youren (at) imperial (dot) ac (dot) uk. In the meantime, you can be entertained by the correspondence between Willetts and organic chemist Dr Paul Clarke. The EPSRC has not yet responded to a request for comment. UPDATE: For a statement from the EPSRC, see the comment below. FURTHER UPDATE: Read how the science policy community is questioning the worth of this new movement. Image courtesy of Ian Huston. They need to decide what it is they object to, the principle of setting priorities systematically and in consultation (the Council is made up of leading representatives of the research community, after all) and sticking to them, or EPSRC’s admittedly ham-fisted implementation of all this… If the latter then fair enough, but the onus is then on them to say how they would do it differently. Kieron, what we object to is the arbitary decisions made by a few members of EPSRC. These key people are pushing their own flawed agenda without meaningful consultation with the community. An agenda which is contary to the advice contained in all the international reports on chemistry, maths and physics previously commisioned and accepted by EPSRC. 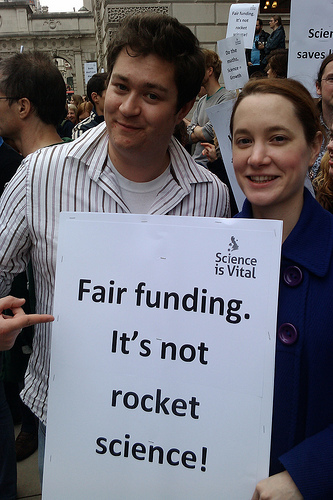 We want the best science to get funded. Our alternative is to take EPSRC back to how it was: administrators not policy makers, and if that is not possible then it should be abolished and replaced with a USA style NSF. It’s funny how the majority of physical scientists and mathematicians I talk too share our views, while sci policy guys (who these changed don’t effect) don’t seem to give a damn. @Paul, I’ve talked to EPSRC funded scientists who think this fuss is overblown – it appears to vary (not surprisingly) according to whether you think your particular area is a ‘winner’ or a ‘loser’. I don’t know what you think is different/better about NSF except perhaps the size of the funding envelope? As far as I can see, there are no major differences in the way NSF and UK research councils come to these kinds of decisions – except NSF has taken ‘impact’ into account for far far longer. I repeat my question: given the funding constraints, what would you do? We can all agree EPSRC have handled this very badly, haven’t been able to give a convincing account of their prioritisation process, etc. etc. I am quite prepared to believe they may have come up with the ‘wrong’ priorities by dressing up an old-fashioned “bunch of guys sat around a table” process as something more rigorous and systematic. But simply to say “we want it to be how it was before” is sinply not credible, and smacks of special pleading. I would also note that the way it was before is already the result of significant prioritisation done over preceding decades, generally of the form of… a bunch of guys sat around a table. I should also add that I think it is a very good thing that the wider EPSRC community is now talking about these things and not leaving it to the usual old guys… It would be interesting to think about how EPSRC and the other councils could engage more systematically with the community like this. But even here there are questions: what is the role of the Council members, and the wider EPSRC research community in this? Are they sources of expertise (which is the *best* science that could be funded, and how?) or are they representatives of an electorate, arguing their own corners? Which is it? Which should it be? Are there any examples of this kind of navel-gazing among another community falling under a single research council? If scientists have previously lobbied as an entire mass (eg, Science is Vital), does this step represent a lasting segmentation? Here’s the EPSRC comment on this matter. More Maytime engagement activities for engineers and physical scientists. EPSRC is aware that some members of the research community are intending to hold a “day of action” at Westminster to air their concerns about some of EPSRC policies. We, of course, respect the right of those individuals to question us and to share their views with government and MPs – EPSRC is, after all, funded by the taxpayer. We have responded in detail to the concerns that have been raised with us and it is because we are committed to engaging widely with the research community that we have also arranged three regional seminars in May where we hope to discuss the funding opportunities available in this coming year and the development of EPSRC strategies for “Developing Leaders” and “Delivering Impact”. @Kieron, I have gone into our (science for the future’s) concerns about both the EPSRC’s policy and its implementation on my sheer lunacy blog, so I will not repeat myself here. Suffice it to say that we are of the opionion that EPSRC should administer the funding of research grants for projects which have been selected for funding (from the whole of the EPSRC remit not some special areas as determined by Deply and his minions) by expert peer review. @Adam, that is a typical EPSRC statement. I have beee to these so called ‘engagment’ meetings. It is where the EPSRC tell the community how it is going to be. EPSRC doesn’t listen to the community at these meetings and doesn’t change policy or direction as a result of these meetings. They are there to dictate to the community what will be and to give the veneer of engagment. The only time I can recall EPSRC changing a policy was when 1000’s of academics signed a 10 Downing Street petition against the blacklisting policy. In that instance EPSRC back-peddled and agreed that even tho blacklisted an academic could submit one application for funding. Actions speak louder than words and in the case of EPSRC inaction is the name of the game. @Kieron I agree that peer review has its faults and is not ideal, but it is the best system we have (to paraphrase Churchill on democracy), and is certainly preferable to administrators deciding on funding bases on personal prejudices and non-expert opinion. Yes, I suspect we would get more out of a discussion with a few pints!…. @Kieron, why don’t you come down to London on May 15th, like Paul, and we could have the discussion then?! @Paul, thanks for the description of the meetings. If it’s any consolation, I just attended a Parliamentary Science Committee on HS2, which also seemed to have the “veneer of engagement” (as you put it). All three guests supported HS2. The opponents were shouted down by the chair.